It is now definitely known that besides being carried on the deck of large tvpe submarines, Japanese midget submarines are also carried in seaplane carriers. Routing space below for use in O. N. I. Besides being carried on I-type submarines and possibly in whaling vessels, as has been suggested, midget submarines are also carried in the holds of certain seaplane carriers such as the Nisshin (sunk) and the Chiyoda, specially equipped for this purpose. The special equipment of the Chiyoda includes a huge hold running through the center of the ship and cutting through the mid-deck (diagram 6-A, cross-section); four sets of 2.040 m (6'8") tracks running lengthwise through the hold, with twelve sets of trucks, each set numbering from two to three trucks; 8 hatchway which can be extended to 24.600 m (80'8¼" - diagram 6-C) by removing 4 beams from the beam shelves; and powerful cranes capable of lifting the 40-50 ton midget submarine. On the Chiyoda cranes 2 and 4, which are on port side, are used for this purpose. The Ko Hyoteki (deck (?) model - midget submarine) carried on the Chiyoda is 23.600 m (77'5") from stem to stern (not including the protruding torpedo tubes, nose guard and propeller guard), and has a maximum vertical hull diameter of 1.850 m (6f) with a conning tower extending about 4'6" above this. 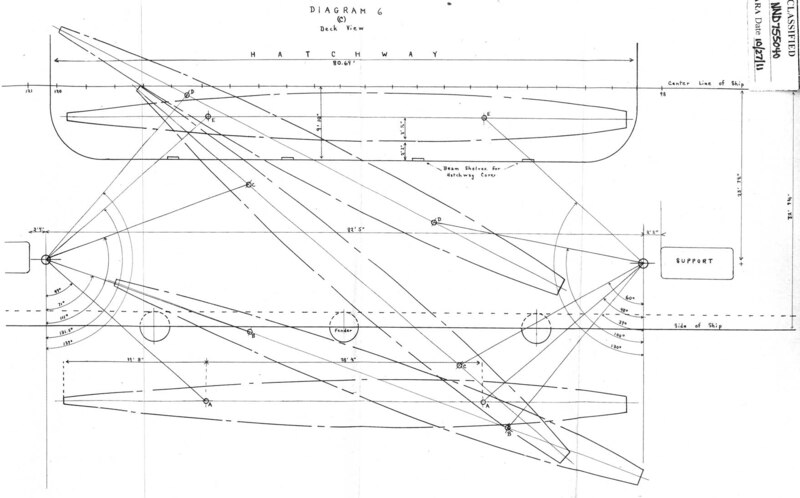 It is fabricated in three sections, foreward(frames 1-18) 17'8½" long, midship (frames 19-53) 35' ½" long, and after (frame 54 to stern) 24'8" long which are jointed by internal flanges bolted and possibly welded together. 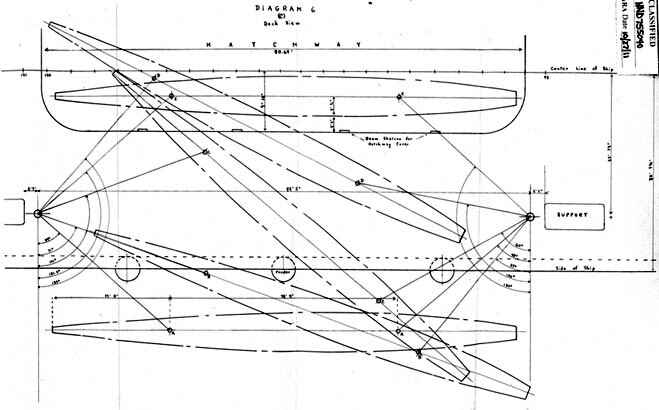 The hull is then divided into ten "kibun" or "units" of equal length, irrespective of where their lines might cut through the functional units of the ship. The outer skin of the ship consists of 8 mm (.315") plates in the midship section and 7 mm (.276") plates in the forward and after sections, supported by metal rings or frames set at irregular intervals of from 210 mm (8¼" between the 64 and 65 frames) to 350 mm (1'1-¾" between the 1st and 2nd frames). 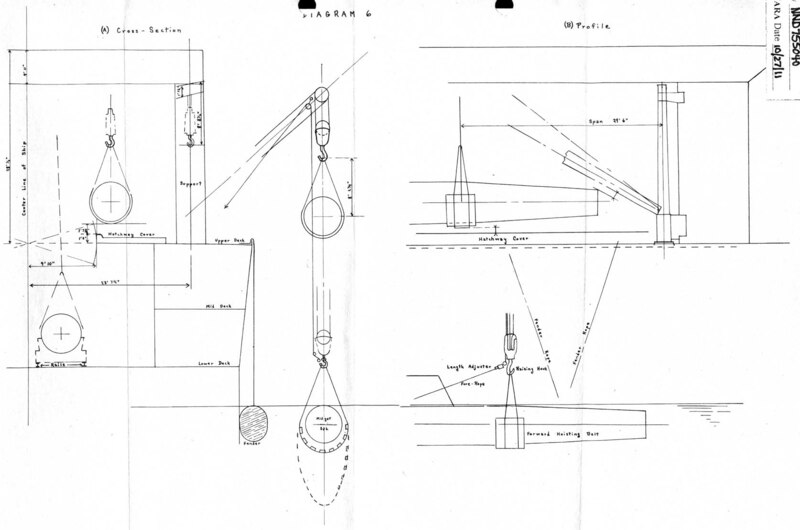 To lift the submarine on board a hoisting belt is dropped from each of the cranes 2 and 4 (diagram2), which have been swung out at right angles to the gunwales, in such a fashion as to form a loop extending about 13 feet below the surface (diagram 3). The submarine is thereupon towed into position within these loops which are then adjusted to the proper places around the ship by the fore and aft ropes which are secured to the conning tower. The belt, consisting of wooden slats mounted on a cable, is then drawn close and latched to the hook. All these operations are performed by crewmen in a small boat alongside and not by members of the submarine crew. 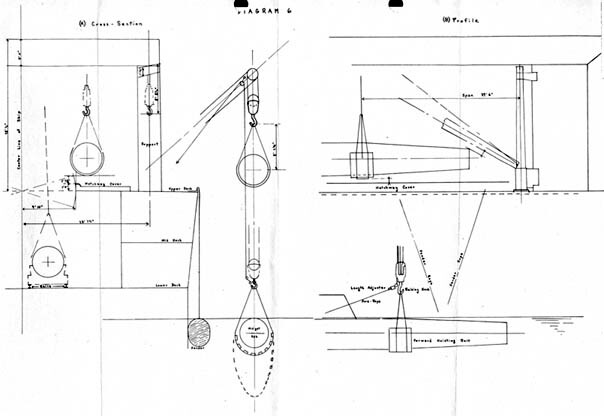 The cranes are then swung through positions A,B,C,D, and E (diagram 6-C) while the hoisting rope is coiled and the submarine swung over and into the hold (diagram 6). It is thereupon lowered onto trucks which run on rails and is stored either on these trucks or is transferred to a cradle. Thus several midget submarines can be carried by a single mother ship, although this would necessarily decrease the capacity for planes. Planes are lifted in and out of the hold through a second hatchway slightly to the rear of the submarine hatchway, but are presumably stored in the same hold and moved on the same tracks. 2 x 18" 77' 5"
* Japanese term used to designate the type of midget submarine recovered in Sydney Harbor. ** Japanese term used to designate the type of midget submarine described in this serial.